Musical instruments provide perfect opportunities to foster a sense of accomplishment. It’s also easier to relax while playing music for it’s nearly impossible to dwell upon regrets and worries that trouble the mind. The question is whether climbing the steep learning curve to musicianship is worth it. I’d like to try to convince you to play the guitar or other musical instrument for the following reasons. 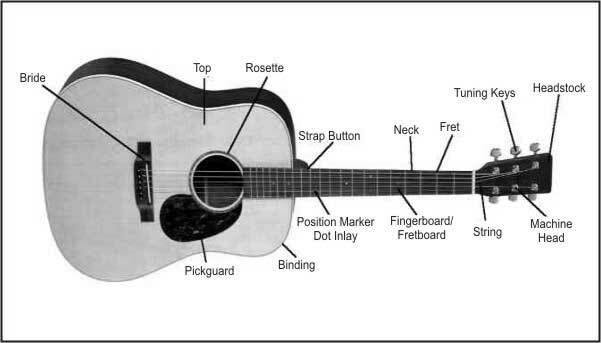 The guitar is one of the easiest musical instruments to learn. An good guitar may be purchased cheaply and is easily maintained by the owner. Every moment played makes you better. There are thousands of 3 or 4 chord songs available to download from the Internet. You will more deeply understand the meaning of songs when you begin to sing them. Your social life will expand as you connect to other musicians. You will eventually have opportunities to share the lime-light and will be applauded for your efforts. Playing a musical instrument will expose you to an interesting and dynamic part of the entertainment industry. One day as I gazed at my bloated music collection of albums, cassettes and CDs I realized that maybe my interest in music was in part due to an unfulfilled desire to actually play. I jealously listened to some of my friends play musical instruments and decided to give it a fair try. So, my 1998 New Year’s resolution was to learn to play the guitar. I reasoned that if I bought an inexpensive guitar and was too lazy to play it I wouldn’t feel too badly. Therefore I purchased a used Martin J40 for about a month’s net salary. I thought if I didn’t play the Martin, I could at least sell it easily since Martin’s are coveted by many musicians. I contacted a local music school and attended a dozen lessons or so. I soon realized I needed to practice very regularly and proceeded to practice about an hour every night or so. Knowing that I couldn’t catch up with my buddies who’d played 20 years or more I decided to take a dozen or so singing lessons to give me an edge in that department. Learning to breath properly helped a great deal. After three years and about 1000 hours of practice I was considered by most of my peers to be an “OK” performer. The path I took may or may not suit you but you’ll never know unless you try. Buy a good six string brand name guitar with a solid wood top to play exclusively in your home. It’s safer to have a used pre-dented inexpensive guitar to play at parties or outside. Inevitably others will want to play it and all sorts of calamities can occur. It’s hard not to worry when a stranger is playing your good guitar in a social situation. American brands include Martin, Taylor or Collings. The label within the guitar will reveal its origins. Attach a strap and protect the guitar in a hard case. Have the salesman play the guitar to ensure it “rings true” for you. Does the neck of the guitar accommodate your fingers? Do the tuning heads adjust the strings smoothly? A cutaway makes it easier to reach higher notes. A clamp style capo is a solid choice. Guitars need to be stored in humidified cases in dry climates. A separate electric tuner makes it easy to tune the strings quickly. A built in pickup and cord is needed to connect the guitar to an amplifier. Keep a spare battery around. Illuminate the page(s) at night with a battery powered lamp. Use clothes pins or a wire to secure the pages when outdoors. Buy a good book showing the shape of music chords. There are many sources of music online. My favorite source of popular songs with simple chords is Betty Lou's Site for Guitar Underdogs. The songs usually print as is but use Print Preview to eliminate extra pages at the end. Print songs on thicker than normal paper and reinforce the holes for they will rip over time, especially the bottom one. Many sites force you to copy and paste the songs into a word processing program. Arial 14 font is easily read by aging eyes. Moving the right margins often expands the printing area. Print the name of the song in very large (36 font) on the back of music sheets too. Insert the pages alphabetically in a 2 inch binder. Reinforce the edges and hinged corners of the binder with duct tape before they crack. Write your name and phone number clearly on the front and back with a permanent marker or use a label maker. Take formal lessons from an enthusiastic teacher at least twice a month. Ask the teacher if you can take one minute videos of critical points. Download and play these snippets on your computer while you practice. Learn easy songs first (duh). Get the rhythm by listening to the song on a stereo as you strum. Many performers use metronomes to steady their beat. Master F and Bm and barre chords sooner than later as they are critical. Buy a label maker and put your name on everything e.g tuner, cords, music book, capo and pick bag for when you begin to play at other locations things just get mixed up. Buy a rubber stamp and stamp all your music sheets with blue or red ink for music sheets often get passed around and misplaced. Use Velcro straps or shoe laces to bind your cables together. If you clamp a capo to the head of your guitar be careful not to poke others or their instruments with the point. Keep your microphone in its pouch/case for protection. Look around you - low ceilings are your enemy and you will bang the head of your guitar when you put it on or take it off. Rest your guitar on a guitar stand preferably in a corner of the room away from foot traffic. Never leave it outside where it might be rained upon or a dog could pee in the sound hole. Ask an expert what type of strings you should use - moderately priced strings are generally adequate to the task. Medium strings do not break as easily in freezing temperatures when strummed hard. Change strings when they sound dull and especially before marathon playing sessions. Coil used strings around themselves and keep them as spares for others. Have new strings available. Use a winder to tighten strings initially. Clip your nails and wash your hands carefully before playing. Polish the guitar using guitar cleaner/wax with a soft cloth especially before playing under spotlights as the smudges are highlighted. Tune your guitar before leaving your home. Before playing, let the guitar sit outside of the case in its stand to get used to the temperature and humidity. Bring extra copies of new music for other players. Have extra picks in your pocket of different thicknesses. If you are very lucky you may have opportunities to play with musicians with many years of experience. It’s very important not to interrupt other musicians while they are playing. Focus on your timing and volume. Play at a volume that allows you to hear others play. Add to the mix in some artistic fashion. Beginning and ending the song on time is important - look for clues. You may “ghost chord” (strum without touching the strings) if lost in the song. Let other musicians know you appreciate their patience and ask for feedback. Always say yes If another musician wants to show you a shortcut. Do not bump other musical instruments as they dent easily. Watch out for cords and speaker wires. Guitar straps are known to let go suddenly – don’t trust them. Be careful to avoid loud clicks when connecting or disconnecting cords from amps - turn down the guitar or amp. Do not place glasses or bottles on amplifiers! Do not drink fizzy refreshments just before singing - you'll likely burp. Smile – some musicians look like funeral directors when they play. Purchase a used slightly dinged guitar for a few hundred dollars. Equip it with medium strings. Lighter coloured picks show up more easily in dim light when dropped. Have a small flashlight available. Keep track of how hot the front of the guitar is. The backs of guitars are easily scratched by belts – pull your shirt or jacket over it - insist others do the same if borrowing your guitar. Keep track of your picks lent to others – ask that they be “threaded” through the strings near the head of the guitar when they are finished playing. String tension varies a lot as you vary the distance from the fire. Strings become brittle when the temperature hovers around freezing. If you can see your breath while singing, strum the guitar lightly. If your fingers stop obeying your commands move closer to the fire to thaw them out. Once the sun has set it’s easier to trip over things in the dark and fall on your guitar - unsling it from your neck and carry it vertically. Store your guitar carefully as it’s vulnerable to damage in the shadows. Keep it in its case if possible during breaks. Playing while others sing your music karaoke style can be lots of kooky fun – go for it! Alcohol may make you sound better in your mind only. Be prepared to be shut down by campground staff when quiet hour starts. - some people have babies and need a break from any disturbance. Start playing earlier in the afternoon if at public campgrounds. Have extra batteries for lights. Use clothes pins to hold the music securely on windy days. A large plastic box with a lid can be used to store and carry most of your equipment and binders from place to place. Music Stand - notice the metal corners are covered with duct tape to protect the front of guitars.